At the DeSoto Friendship Center, a support group for family members who are unexpectedly raising young children again is a lifeline for participants, who learn new parenting tools and connect with others in the same situation. Our DeSoto County operation is focused on nutrition, social engagement, healthy aging services and support for caregivers. Check out Services for details about all of our programs. The DeSoto Friendship Center is a place to get connected, make new friends, find support and be involved. Located in downtown Arcadia, the Center’s activities include games, puzzles, bingo, crafts, sing-alongs, health screenings and special themed parties. You can also join us for a low-impact workout designed for both strength and endurance. We can help arrange for the most appropriate care for your older relative, family and you. Knowledge, experience, respect and compassion ensure that you and your relative feel comfortable with the decisions made and the quality of care provided. Our trained case managers provide assessment of needs, in-home services, follow-up visits and monitoring of care. Call the Elder Helpline at 866.413.5337 or inquire through our office at 863.494.5965. Our Caregiver Support Group can teach you how to cope with the stress of being a caregiver. The group meets monthly to share experiences, express frustrations, seek advice from others and learn what resources are available and how to access them. We also offer a close-knit support group for Grandparents Raising Grandchildren and Other Relations Raising Relations. These monthly meetings are a lifesaver for those who find themselves in this challenging situation. For both of these programs, call 863.494.5965. Classes at the DeSoto Friendship Center are available on subjects ranging from CPR/AED/First Aid, sign language, skills for daily living for the visually impaired, Alzheimer’s education, safe driving for seniors, and scams and fraud, as well as seminars and programs dealing with health issues. Guest speakers offer programs on topics of special interest to seniors, including health and nutrition education. We invite you to enjoy a healthy meal in the Friendship Café, a friendly social setting for the 60+ crowd, right at our centrally-located DeSoto Friendship Center. More information is available at Nutrition & Dining. Friendship at Home pairs volunteers with isolated elderly residents who are physically unable to care for themselves and lack the support they need, enabling elders to remain in their homes with dignity and independence. Friendly visitors brighten the life of an isolated older adult with an in-person visit, while Telephone Reassurance is a lifeline to older adults who are homebound and alone. To learn more about this service, call us at 863.494.5965. Nutritious meals delivered to your door can make all the difference in the world if you become unable to cook for yourself or if you simply want to be assured of a healthy meal. Many people find it difficult to shop, navigate the store aisles or decide what to buy on a limited budget. If you are interested in receiving home-delivered meals, call the Elder Helpline at 866.413.5337. 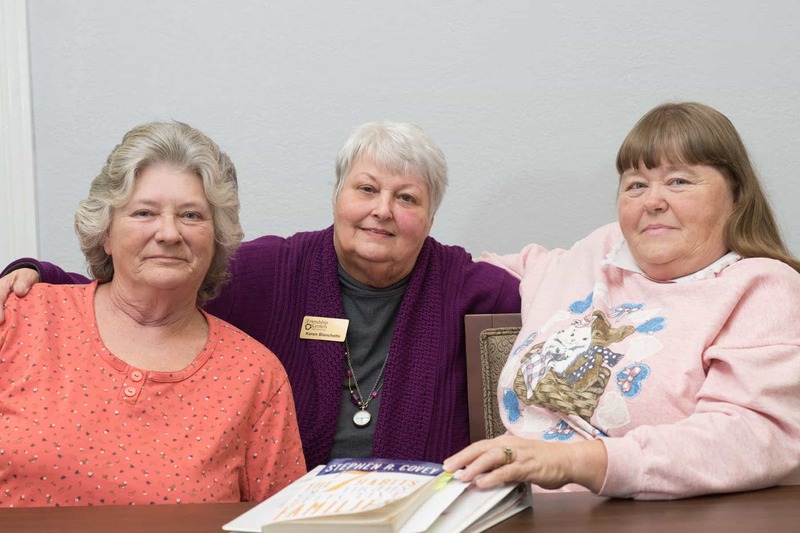 The DeSoto Friendship Center has an extensive resource library with information on the many agencies serving the needs of DeSoto’s residents, especially seniors. Our trained staff and volunteers can guide you through the many resources available. Out-of-town agencies can arrange to meet with you at the Friendship Center to address your needs.